A tax on sugary foods and drink is not "off the table", according to Health Secretary Jeremy Hunt. Later this month, the government in England is expected to publish a long-awaited child obesity strategy. In the run-up there has been much discussion over the benefits of a tax on sugary foods and drinks. The government has recently appeared to move towards that option, but it is still not clear whether it will be included in the official strategy. 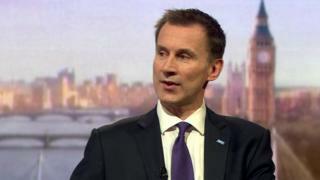 "David Cameron has said that if it isn't a sugar tax then it needs to be something equally robust, but he has not taken a sugar tax off the table," Mr Hunt told the BBC's Andrew Marr show. Health experts have been campaigning hard for a sugar tax to be introduced, and Public Health England, which advises the government, has put forward a case for it. Mr Hunt said the government's strategy was likely to attack obesity from a number of directions. "Partly it's what food manufacturers do and that's why you have discussion about taxes on drinks. It's also what the retailers do, it's what schools do, it's what parents do," he said. Media captionAndrew Marr speaks to Chef Jamie Oliver. 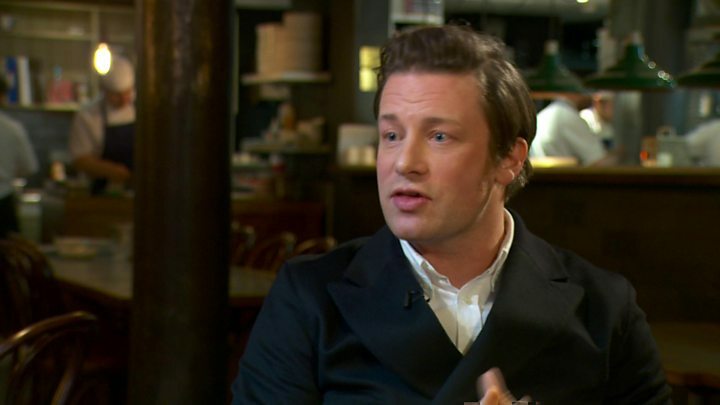 Celebrity chef and campaigner, Jamie Oliver has been putting pressure on the government to introduce the tax and he wants the proceeds - which could amount to £1bn a year - to be invested in health promotion and schools. "Anyone you would trust your kids with is in support of this," he told Marr. "I don't mind not getting the tax, if there is something better and more symbolic because what we need is a change and a moment," he said. He asked the David Cameron to "be brave and be bold" and to "hurry up".